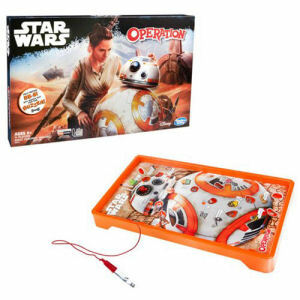 We have Just Sold out of Star Wars Edition Operation Game starring BB-8. This Item is unavailable at present. From the Star Wars The Force Awakens collection by Hasbro. Star Wars Edition Operation Game starring BB-8. BB-8 has 12 defective parts to be removed. For 1 or more players. Requires 2 AA batteries that are not included. Ages 6 and up.